Video clip synopsis – Australia's far north Arnhem Land is patrolled by the wildlife ranger. In a remote and vast area of pristine natural beauty, the work ranges from tracking wildlife to rescuing baby turtles. Broadband MP4 ranger_bb.mp4 (10.4MB), suitable for iPods and computer downloads. 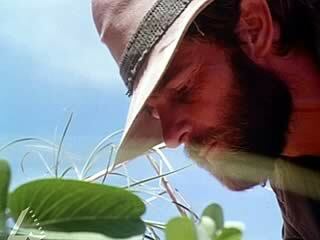 Wildlife Ranger is an excerpt from the film Wildlife Ranger (19 mins), produced in 1979. Wildlife Ranger: Set in the beautiful but isolated Kakadu National Park in the Northern Territory, Wildlife Ranger traces the duties and lifestyle of a national park ranger, including protection of and research into the diverse range of flora and fauna in the area. The program follows two rangers plying the boat along the waterways in the wet season to check out a remote rookery. This allows the viewer a close inspection of this unique environment, both at ground level and through breathtaking aerial photography. The northern monsoonal forests, grasslands and wildlife are shown in all their beauty, colour and diversity. The program also touches on the problems of remoteness from major towns, illustrated with the arrival of the fortnightly mail plane from Darwin. Wildlife Ranger was produced by Film Australia. Much of Australia’s far north is tropical wilderness that falls within various National Parks. The Cobourg Peninsula is situated on the northwest corner of Arnhem Land and juts out into the Arafura Sea. The peninsula is part of the Garig Gunak Barlu National Park and is managed jointly by the traditional Aboriginal land owners and the Parks and Wildlife Commission of the Northern Territory. Governments employ wildlife rangers to patrol remote areas and enforce environmental laws, for example; the poaching of crocodiles. Much of their work is prevention as well as enforcement. The wildlife ranger has a vast area to patrol. He has to love living and working in a remote wilderness area where food may be dropped off by plane and many nights are spent camping outdoors. He needs many skills for this kind of work including sharp observation of nature. Pristine wilderness National Parks are a highly valued resource and in need of protection. List five jobs the ranger has to do. Explain why his wife doesn’t worry about him. Write a 50-word description of your impression the ranger and his work. Discuss and list the personal qualities and physical skills the ranger displays. Give reasons why the ranger carries out this work What are the costs and benefits to him? List the costs and benefits of our society in doing this work. Do you think that it isnecessary investment? Give reasons. The video clip shows a male ranger. Do you think females could do the job of ranger? Give reasons. Discuss and define the term ‘hero’. Would you consider the ranger to be a hero? the map overlaying the aerial shot at the beginning of the clip?